TFD » Blog » Posts tagged "spring wedding flowers ideas"
Most people will tell you that summer is their favourite season. But here at bridal florist Todich Floral Design, we'd stand to argue that fact, especially when it comes to weddings. Spring can be one of the best seasons to have a wedding for a variety of reasons. First and foremost, the flowers. This is the season for bright, cheerful wedding flowers. Tulips, daffodils and other beauties are at their prime during spring and you can be sure that you will get these flowers fresh and at a reasonable price. Tulips, for example, come in such a variety of colours that you will be sure to find the shade you are looking for, or if you are looking to go multicolour, with this wedding flower you will get a palette as wide as you can imagine. One tulip shade that is really pretty is a light dusty purple. This is a shade that will work magnificently on its own. Or you can combine it with bright yellow flowers for a wedding to make a brighter impact. This is a shade that will work magnificently on its own. Or you can combine it with bright yellow flowers for a wedding to make a brighter impact. If your wedding is going to be more toned down, refined elegance, then intersperse the light purple wedding flowers with deep egglplant coloured ones. Of course, roses are one of the main flowers symbolic of love and give you a whole palette of colours to work with. 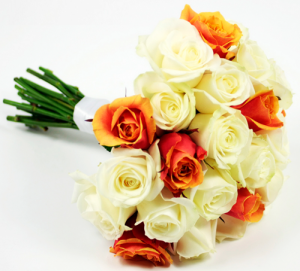 One really great spring wedding flower idea is the combination of orange, white and yellow roses, with the bridesmaids wearing pale violet dresses. The contrast and the perfect spring palette of this combination really catch the eye. Fresh daffodils are hard to get in any other season, so if you are fan of this wedding flower, or the colour yellow, a spring wedding is the perfect opportunity to take full advantage of it. One lovely idea is to use monochromatic daffodil bouquets, with bridesmaids wearing different shades of the spring palette. This combination looks best with pale coloured dresses and bright bridal flowers, as if the dresses and the flowers are bright it can be a bit too much. Daffodils do not only come in yellow but white as well. There is a light airiness to a bouquet of delicate paperwhites, which cannot be compared to any other flower. Bunched together this flower looks like a collection of pretty little white stars and will look very up-to-date and fresh at a spring wedding. Plus they smell wonderful too! The one tricky part of weddings in the spring is that the weather is not quite as predictable. So you always want to have some kind of rain-proof solution, in case the weather turns on you. One lovely outdoor wedding solution is to have colourful umbrellas hanging over the seating area. If you have an indoor venue, umbrellas can be given away as gifts, and in the UK you can be sure your guests will make use of these even after the wedding has passed. It’s not only flowers in London that bloom in spring but love as well, so if you have always wanted to have a spring wedding, we say don’t hesitate!